You are assured of a very warm welcome when you arrive at Dorset Farm. Offering both farmhouse Bed and Breakfast (b&b) and self-catering accommodation Dorset Farm nestles in beautiful countryside near Launceston, the old capital of Cornwall. We enjoy the best of both worlds - great access from the A30, Exeter and Newquay Airports or Plymouth railway station coupled with the tranquillity of an old Cornish farm. We have acres of space stretching right down to the River Tamar where you are free to wander at your leisure. In our woods you will discover signs of days gone by in the old Launceston to Bude canal along with a wide variety of wildlife. You can watch from the comfort of our hide with its extensive views over woods and river. We also have a fabulous new garden room where you can watch the sun go down. Things to do, places to go.... Nearby there are lots of fascinating attractions to visit covering everything for garden lovers - (e.g. the Eden Project for one) to surf beaches (Bude / Newquay ). See the ‘Places to See’ page ( under Activities) for some ideas. Plants, birds and animals.... Because this is a working farm and because we have exceptional wildlife we are regretfully unable to accommodate pets. 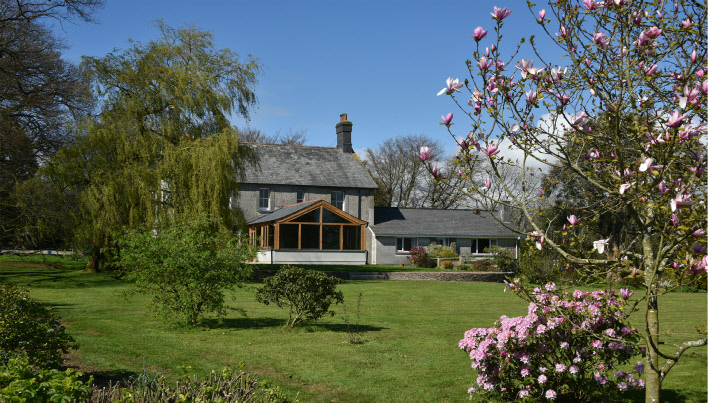 Dorset Farm is an ideal place to explore Cornwall in the spring, summer, autumn and winter. Why not join us for beautiful countryside, peace and quiet - you’ll love it. There is just so much to see and do. Please note that we can only accept bookings of 2 or more nights on all rooms.